Travelling by train in India used to be a challenging experience that started with the problem of making a reservation in the first place. The hassles continued when you boarded the train and only ended with arrival at the destination. Today the process is far simpler aided by the use of the Internet for reservations and greater capacity on trains. 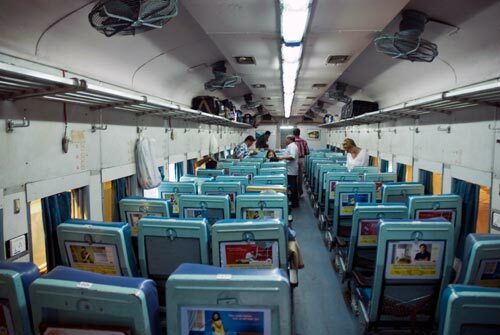 Photo - Inside an AC chair class coach on the Brindavan Express to Chennai. Train number 2640, the Brindavan Express, is one of the most important trains linking Bangalore and Chennai. Departing from Bangalore at 14.30 the train takes just under 6 hours to complete the 362 kilometres between the two cities which hardly ranks as express train performance with an average speed on 60 km/hr! Usually loaded to 22 carriages behind a single locomotive performance is not the prime measure of this train. In addition given Indian Railways penchant for slow starts from stations and numerous intermediate stops the train needs to reach maximum line speed of 120 km/hr wherever possible. However despite the lack of speed the train manages to shift vast numbers of people each time it runs with space for 1000 second class sitting and 150 seats in AC chair class from Bangalore. Adding in passengers joining along the way it is likely that by the time Chennai is reached the 22 coaches are home to about 2000 people. Waiting at Bangalore City station usually means you are able to witness the inbound train arriving from Chennai. You can stand and watch the hordes of people disembarking especially from second class sitting and unreserved coaches. You can also watch the train being cleaned with high pressure hoses the preferred method on sanitising the toilets and a quick brush through to lessen the dust and litter. 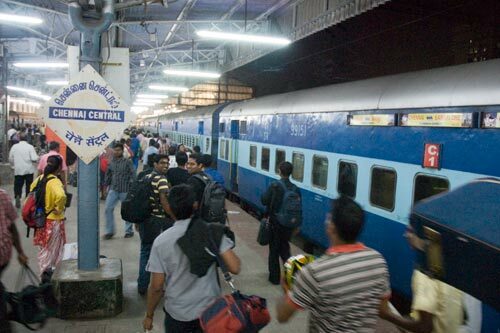 With boarding allowed the train quickly fills especially in unreserved accommodation where minor scuffles are the norm as people try to claim territory. Reservation lists are pasted on the ends of each coach where your name and age are clear for everyone to see. With reserved seats the pace of boarding is much less frenetic and most people have settled by the time the train departs. By leaving the platform slowly latecomers are able to catch the train by running along the platform and leaping aboard through open doors. Reaching a more healthy speed the train soon brakes ready for the first stop at Bangalore Cantonment where many more board the train. Finally leaving the suburbs behind, the train threads through a variety of scenery on its way to the coast. 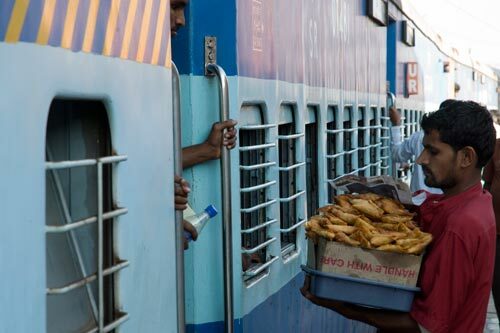 At frequent intervals bearers pass through the train selling hot and cold drinks, snacks and nibbles produced in the pantry car. Service is sharp and prices reasonable. Stops at Krishnarajapuram, Bangarapet, Kuppam, Jolarpettai, Vaniyambadi, Ambur, Katpadi Junction, Walajah Road Junction, Arakkonam Junction and Perambur all follow the same pattern with the train standing for only a couple of minutes before moving on. In the brief time standing at the platform a variety of licensed vendors nosily announce their wares concentrating on passengers in the unreserved and sitting coaches. Darkness falls at which point it is interesting to go to the end of the carriage and with the door open sit on the top step and watch the 22 coaches snake their way through the darkness. Outside of the main towns and cities there is relatively little light pollution which accentuates the night. Ahead the glow of Chennai reflects in the clouds and it is not too long before the train draws to a halt at Chennai Central station. Here porters board the train looking for business arguing prices with their prospective clients. Once on the platform you get carried along by the shuffling hordes of passengers making their way to the exit. You have arrived in Chennai greeted by the warm night air and interesting aromas. What has changed in the last thirty years? Well the trains are faster and more reliable. It is easier to get seats and there are more of them to reserve. Sadly steam has disappeared and instead of an immaculate WP class 4-6-2 at the head of the train you are hauled by down-at-heel diesel or electric traction. What has remained the same? The experience remains an interesting way to spend time with some amazing sights glimpsed through the tinted windows of air-conditioned coaches.